When a building is newly constructed and commissioned, the HVAC system is typically well tuned for energy efficiency. However, over time, equipment failures, user modifications, wear, etc. can cause significant degradation and energy waste. After 3-5 years, a gain of 30% in unnecessary energy use is common. Many existing buildings have older technologies such as pneumatic HVAC controls, manual air-handlers, chillers, etc. Since these legacy systems do not provide sensor or diagnostic data, there is no easy way for the building manager to know if or why performance degrades. This often results in unhappy building occupants who give irritated service calls when the building becomes uncomfortable. Also, it leads to energy waste, higher utility bills, and extra labor for troubleshooting and maintenance. 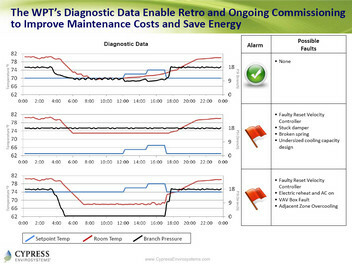 The patent-pending Wireless Pneumatic Thermostat retrofit solution includes built-in sensors and diagnostics which help to identify problems when they happen, and in some cases, predict failures before they happen. The built-in sensors include setpoint, ambient temperature, and branch pressure, which can help to pinpoint and correct problems such as incorrect setpoints, stuck dampers, miscalibrated reset velocity controllers, etc. See example of on-going commissioning plots here. Similarly, the Wireless Gauge Reader and Wireless Transducer Reader retrofit solutions help to collect sensor and diagnostic data from legacy air-handlers, chillers or other mechanical equipment for ongoing commissioning. All the retrofit solutions described above take only minutes to install, and provide tools to analyze trends, set excursion alarms, and store historical data so the facility manager can proactively respond to a problem before a tenant complains. The Wireless Pneumatic Thermostat improved energy savings and reduced maintenance cost which accelerated the payback period for Santa Clara County to 16 months.